THE 50th anniversary of the Bretton Woods Institutions (the World Bank and the International Monetary Fund) has certainly not been an auspicious one. Since early this year, these agencies have been ' facing a lot of flak. Environmentalists have constantly accused them of flouting basic environmental norms, and going ahead with projects which have proved disastrous for global ecosystem. The case has been further strengthened by a report published by the prominent environmental activist group, Friends of the Earth. It shows how forest covers in the Philippines, Ghana and Guyana have been shrinking at an alarming rate, thanks to the lop-sided policies of the International Monetary Fund (IMF) and the World Bank. The report, The SAP in the Forest, studies the impact of 'the structural adjustment programmes (SAP) of the World Bank and the IMF. Through the SAP, the international money lending agencies monitor loan utilisation by recipient nations. In the Philippines, Ghana and Guyana, the SAP has spelt doom for their rain forests. These agencies have been unabashedly promoting logging and agricultural exports, without bothering about the effects on environment. In the Philippines, the process began as early as 1980 when the Bank launched its reform-based lending November 30,1994 Down To Earth programme. Stressing that the country needed to boost its foreign exchange base, the Bank declared that the "only other (apart from pineapples and bananas) important source of short-term exports is forest industry". So the already flourishing logging industry there began functioning even more vigorously. Besides, transnational agri-business corporations like the Philippines Packing Company (a subsidiary of Del Monte) and Stanfilco (a Castle and Cook affiliate), exploited the Filipino government's desperate bid to earn foreign exchange, and acquired huge land holdings leaving a large section of farmers and tribals landless. According to Friends of the Earth, these peasants were forced to migrate to the hills and live off those forests which were so far uninhabited. In Ghana, to ward off a severe financial crisis, the government was forced to seek an if-Bank assistance. Now the forest industry is highly unregulated. The Bank's Export Rehabilitation Project (EXRP), justifying that Ghanaian exports would increase, plans to rehabilitate key export sectors, thus requiring removal of various controls on timber projects. However, no regulatory mechanisms have been mentioned at all. This led to a massive increase in logging. Between 1984 and 1986, the EXRP was financed through grant aid from the UK's Overseas Development Assistance, credit guarantees through the UK's Export Credit Guarantee Department and the Canadian International Development Agency, supplemented by the Bank's own contribution. Consequently, more such logging companies have been unleashed. Between 1983 and 1990. Ghana's export of wood and wood products rose from $15.8 million to $53 million. In the case of Guyana, logging activity (as part of the Bank's policy to promote export) has also increased considerably. Given the limited regulative capacity of the timber sector, these operations are sure signs of greater forest degradation. 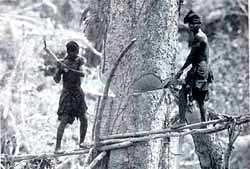 In October 1991, IAS million ha of forest was leased out to Barama company for a period of 25 years. The company is a joint venture between Sunkyuong of South Korea Samling of Malaysia, involved in swamping, plywood manufacture and logging operations. Apparently, the National Forestry Action Plan had its consent to these operations. The report claims that the key problem in the IMF-Bank approach is their penchant to impose these so-called "generalised solutions". The Friends the Earth suggests that an "ecological economics" must be developed to frame the objectives of adjustment programmes. "The short-term economic priorities of the donor and the creditor community must not be the sole determinants of adjustment policies", specifies the report.